if ever there was a misleading heading, that is probably it. not the bit abut cervo rosso, but almost certainly the part about the iceman. it's the 10th of november, a date that i would normally be happy to consider, if not the depths of winter, certainly its inner fringes. there is something quite exciting about digging out the winter cycling kit, if not least because it usually means you get to wear more of it than the spring summer stuff. 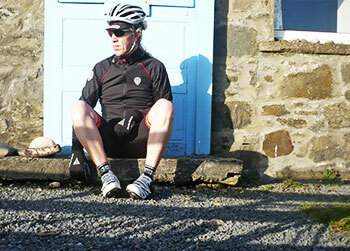 a long-time fan of long-sleeved jackets and jerseys, there is for me at least, a satisfaction in reaching for the lower regions of the cycling wardrobe and being suitably cosy prior to departure from the bike shed. perhaps even more so at this time of year, it is prudent to pay attention to the mantra that dictates if body heat is more than comfortable within the first five kilometres, then there's every chance too much of the winter garb is being worn. that's where the iceman steps up to the plate. or rather, in this case, doesn't. 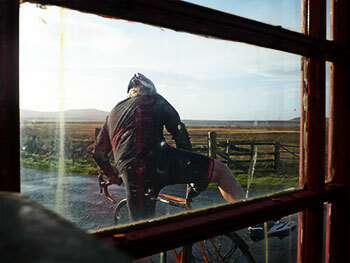 faffing doesn't really do it for me; i like a smooth transition from civilian to cyclist and i'm on my merry way. this morning's faff concerned swapping tyres on the colnago to acquire data for a review further along the line. it ill behoves the mechanic (me) to render insufficient attention to the tread direction in relation to that of the wheels. surely even sod's law should not allow the fitting of two tyres backwards? thus the faffing occupied more time that should have been the case, and frustration took its toll on body temperature. blue skies, strong wind and the notion that it is november led to a misjudgment of not inconsiderable proportions directly related to the insulating factor of a cervo rosso intermedio jacket. it has windproof panels and fleecy bits combined in a strategy that will protect the unwary from themselves, but its secret weapon is its insubstantiality. i mean this as no criticism; quite the contrary. it's just that a jacket offering winter protection, wind resistance and the ability to laugh in the face of subtle precipitation, clearly shouldn't be this light or this thin. thus, despite little evidence of the iceman participating in today's force majeure, the perceived need to augment bodily cosiness was quite overwhelming, taking the shape of a short-sleeve jersey layered on top of a long-sleeve baselayer. who would have called me over cautious for so doing? not i.
but i should, in all honesty, have known better. for was i not more lightly dressed in colder temperatures over last weekend? you bet your sweet bippy i was. 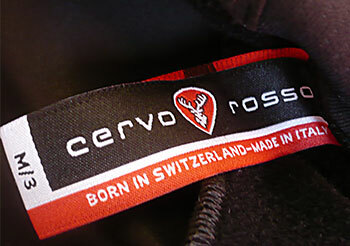 the confusion has a history: cervo rosso describe the intermedio jacket as a mid-weight, windproof jacket, but in my innocence, i didn't really know what that meant. so many apparel manufacturers, in my opinion, misuse the word jacket; for some it is a jersey, for some it's what most of us would think of as a jacket. though the intermedio offers a slim and tailored fit, there is no doubt that it could easily swallow a long-sleeve jersey without blushing, and if that's the case, then i probably should. so i did. that first ride was too warm, but how could that be? admiitedly the jacket has fleecy bits inside interspersed with windproof bits, but if it were a duvet you'd surely think twice. isn't technology wonderful? the second ride was more abstemious; the jersey was forgotten and the elements were braved in only intermedio and a long-sleeve baselayer. if, like myself, you answer to anyone mentioning the phrase 'honed athlete', then body temperature, while encased in the latter combination, will suffice as calories, watts and beats per minute merge into one long surge of speed. however, this does not take into account the possibility of suffering a mechanical on the outer edge, where shelter is hard to come by, and the atlantic winds couldn't give a stuff. circumspection, therefore, is more persuasive towards wearing a jersey and filtering the watts into separate compartments. stowage space is limited to a single zipped pocket across the lower back of the jacket, handy enough if your needs are minimal, but i can't help thinking that the more ubiquitous three pockets would cater to a wider audience. and perhaps a compact and bijou inner pocket would be handy for coffee money. the advantage of wearing a jersey underneath is as an aid to windproofing, for though intermedio by name and by nature does its job above and beyond the call of duty, confusingly, the shoulders are not favoured with windproof panels. this, in mitigation, was only noticeable when the baselayer was all there was between me and draughtproofing. a minor quibble i agree, but perhaps worth noting. the full-length, waterproof zip has a home to go to at both top and bottom, zip garages that prevent snagging on jerseys at the bottom, and ever so sensitive skin at the top. there was the odd faff moment on zipping up, where the inner portion of the red zip garage seemed intent on denying the zip puller its true resting place, but i've a sneaking suspicion that had more to do with pilot error than that of manufacture. the sleeves, of commendable length and cuff closure are intelligently panelled to allow not only an impressive degree of freedom of movement, but a suitable combination of fleeciness and windproofing. it does no great harm that it looks rather cool into the bargain. so, if the iceman cometh, or cometh not, with what would the sartorially predisposed, yet weather aware cyclist pair the jacket for ultimate comfort, speed and just a little indulgent joy. i know you'll think me eccentric, but in this case, november and the iceman notwithstanding, how about cervo rosso's winter bibshorts? many years ago, when i would have passed for a signed up member of the cyclists' touring club (minus the beard and sandals), i met a fellow cyclist en route to arran who was clad in one of those hideous lemon yellow jackets and a pair of bog standard cycling shorts. as one attired for the elements in somewhat more precocious legwear, i enquired as to his obvious predilection for wearing shorts in the face of adversity. though his answer was a tad lengthy, the gist of it was legs are waterproof', a sentiment with which it is hard to argue. but not only are they waterproof, they have an uncanny propensity to be all but ignorant of the cold (depending, of course, on how you define cold). 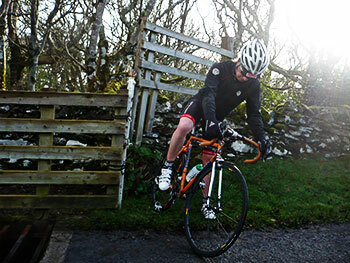 add to that, the fact that cervo rosso winter bibshorts are luxuriously lined with unashamed fleeciness, and those initial quizzical glances begin to ameliorate. 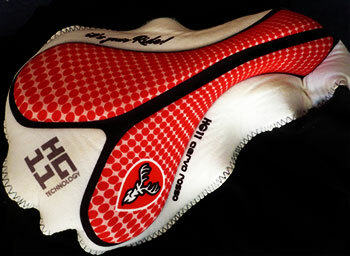 simply put, these are ruddy marvellous. the red piped bibs are firm yet all but pressureless; as a not very big person, i usually take a small size in bib anythings, which occasionally results in bibs designed for a shorter person than i, and the leaving of red marks on the shoulders. no such problem here. i have unilaterally defined a well-fitting bib short as one that takes a modicum of wriggling to get into. if the shorts slide on without so much as a sign of consternation, then chances are there will be movement afoot in the saddle. 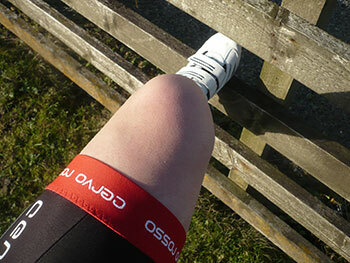 cr's bibs fit my shorts theory to a tee, and the red gloop dotted hems patently stop any riding up without preventing blood flow to the legs. if it is not too unseemly to mention the inner regions, the garishly decorated hg11 pad is one of the finest my bum has sat upon. but it's winter; are they cosy? the bulk of the lining is good old super roubaix a material that not only inspires by its name, but singlehandedly exudes cosiness even in its spare time. the other fleecy stuff that is not super roubaix is less impressively monikered thermodream, but carries out its employ with gusto despite wishing it had been called super flanders or super something else. though in similar manner to every other pair of shorts on the market, they offer no protection to those important knee joints, everything north of there will think it's still summer. if i might be so bold as to offer a small suggestion, in the light that these are offered as and named accordingly winter bibs, a modest lengthening of the legs might be a welcome adjustment. they are not short shorts by any manner of means, but an extra centimetre or two of length would take them from being almost perfect to even more almost perfect.